Hello everyone, I had started making this card for Just Magnolia challenge using their sketch.....well I didn't quite make it......so here it is anyway. I had a blast making this. This being my second Tilda card and my first prismacolor gamsol card. I used pp that my son Cody had bought for me at the Dollar Tree from Miss Elizabeth......now didn't he make a great choice! Thanks Cody!! The shell was from 2003 a die cut from the scrapbook store. The pier piland was cut from Cricut from the LAB cart. at 2 1/2 and on the flip. Down by the Sea was cut at 1 1/2 from LAB. Prima flowers, stickles, sea shells, MS halloween fence punch (I think it also looks like beach fencing) Autumn leaves stamps, and hemp rope. TFL! Sos, so beautiful!! Very creative and unique!! Some Challenge Blogs are looking for DT-members... maybe you should give it a try...?? You find the challenges at my blog! Dawn..this is just beautiful! WOW! Girl..u are so gifted! :) have a great wkend! BTW, love the music here! i love your blog i came to it via the cricut MB. 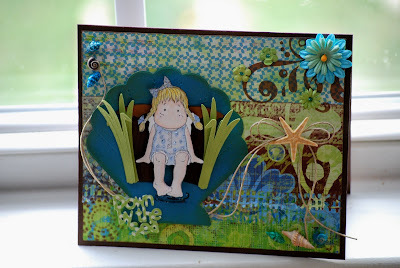 You do such good work...love this tilda card...she is so cute the are colors are wonderful as well. Hey you! Love this! Super cute, you did a fabulous job! I really love your cards! Beautiful!! I luv all the colours expecially all the green. You have a fab weekend also. Thx for the sweet comment! Thanks for visiting my blog...I'm glad I got a chance to see your beautiful work!! Hi Dawn - this is absolutely fabulous. I just love everything about it. Such amazing attention to detail and I just love Tilda sat in her shell. Have you seen the colours at Colour Create this week? This is stunning Dawn, two of my favourite things, combining the bug with stamps, and that colouring...wow. You really nailed this one. Holy Smokes!!! Would you look at this beauty? Lovin' every last peice of it!! The layering is fantastic, your colors are perfect for a seaside creation and every last embellie is perfect!! I randomly linked over to your blog from the CC blog, can't wait to see the rest of your creations! So fabulous! Love your gorgeous card! Wonderful colour and detail! Thank you so much for joining us at Colour Create! Beautiful. I love the shell shape. Great colours.